Members of the Joint Comprehensive Plan of Action (JCPOA) commission attend a meeting at the Palais Coburg in Vienna, May 25, 2018. The Joint Comprehensive Plan of Action (JCPOA) is a detailed 159-page agreement with five annexes reached by Iran and the P5+1 on July 14, 2015. Known as the nuclear deal that was endorsed by U.N. Security Council Resolution 2231 and adopted on July 20, 2015, it was a resolution drafted and proposed by the U.S. itself and adopted unanimously by the Security Council. According to certain requirements set forth in the agreement, the International Atomic Energy Agency (IAEA) ratified Iran's compliance with the nuclear-related provisions of the JCPOA. Nevertheless, on May 8, 2018, U.S. President Donald Trump announced the U.S. withdrawal from the JCPOA and reinstated U.S. sanctions on Iran to wield strength as a weapon against Iran. According to statistics, Trump's use of sanctions is up 30 percent since Barack Obama's last year. This approach is one of the many examples of how multilateralism would be challenged by unilateralism or even bilateralism. However, unilateralism or bilateralism would not succeed in every situation. This is one of many historical strategic mistakes the U.S. has made, since there are some consequences, like the creation of international consensus against the U.S. government. This consensus may neutralize the U.S., the Middle East, new powers and security arrangements and it has already made JCPOA the leverage for the EU and other great powers like China, India, France, and Russia to put pressures on the Trump administration based on their own capacities. It is because this process has formed a strong diplomatic and economic front against Trump's preferential unilateral, personalized and self-destructive move. 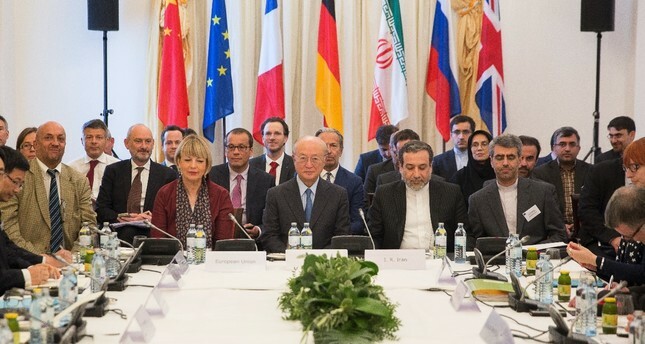 Given the political support of the EU and other great powers on the full implementation of the JCPOA, and considering the formidable hurdles in front of the foreign policy decision making process within Iran, questions arise as to how this dispute will determine the fate of JCPOA and whether any potential shift of multilateralism to bilateralism will occur, and whether a preferential bilateral or multilateral agreement would make Iran the victim of a wider political and security game. First, there are some serious parallel negotiations and lobbying going on behind the curtain both within Iran, in the U.S., between the representatives and envoys from Iran and the U.S. and also some trilateral negotiations going on that the EU has been actively engaged in for the full implementation of the JCPOA based on the timeline, which was set forth as October 2025, the termination day of the agreement. If Iran can benefit from these negotiations, it would be able to prevent becoming the victim of wider international and regional political and security games. It also depends on how the U.S. and the EU will concede. Second, the latest statements of the EU leaders and, in particular, Federica Mogherini, the High Representative of the European Union for Foreign Affairs and Security Policy, regarding the willingness of the EU to keep and promote multilateralism, and her highlighting on the existence of major difference between the EU and U.S. on multilateralism, recall some messages. The gap between the two sides of the Atlantic is becoming deeper: along with the JCPOA, Trump's withdrawal from other multilateral agreements such as NAFTA, the Trans-Pacific Partnership (TPP) and the Paris Climate Accord have also deepened this gap. The gap becomes a provocative factor for the Trump administration to start the trade war against many of the U.S., old EU and non-EU partners. This attitude made the EU design a new system of financial payments or transaction to deal with the U.S. sanction against countries like Iran. It also caused Iran, Turkey and Russia to design new ways forward to withstand the U.S. pressures on economic and trade affairs. Trump's unilateral move has caused more consolidation of the EU and this would bring a form of isolation for the U.S. even for a short time span. Coming to the nature of U.S. multilateralism if we can only say that President Trump and his team ordains preconditions for Iran and the world to follow the U.S. policies. This is particularly preposterous as it contradicts the international diplomatic norms and undermines diplomacy and multilateralism. Thus, it is no surprise that the decision unilaterally adopted by the U.S. administration have either been ignored or received negatively by the international community, including its allies around the world, with the exception of a handful of U.S. client states in the region. Considering all these causes and effects, I conclude by the following presuppositions that in one way or another it indicates multilateralism would surpass unilateralism; however, we shouldn't ignore the realities of global politics and international relations in the sense that members of a multilateral agreement would potentially shift to a preferential bilateralism. Firstly, the U.S. and the EU would compromise to a certain point since the continuation of such an approach will be detrimental to both sides in the long run. Secondly, the U.N. sees it as a model for both regional and international multilateralism and as a diplomacy lesson. It would probably keep supporting the implementation of the JCPOA. Thirdly, the EU and many others within the U.S. are also aware of the significance of JCPOA as a historical achievement and a valuable gate for their new economic and political initiatives. Thus, they would probably resist implementing the JCPOA. Fourthly, the nature of current new power arrangements in the region, as the fundamental issue underlies the rise of regional conflicts, will not remain the same; based on the lessons from history, the U.S. will sooner or later abandon its support of its regional clients. It would instead make U.S. officials renew regional policies; one of which would be the retreat from their current policies on the nature of JCPOA. As the average of these presuppositions, I would conclude that world politics is in urgent need of multilateralism to neutralize the great powers' unilateral policies, although they may be seriously affected under U.S. unilateral pressures, along with its own huge domestic hurdles, due to various domestic and foreign policy mismanagement, fueled by the people's political culture and the worsening of the sociocultural environment. Iran has adopted necessary preventive measures and has strategically fixed and preserved its regional and international red lines, in particular, during the last decade. Despite the U.S. insistence on turning a blind eye, both the great powers and the EU are well aware of this situation that makes multilateralism more attractive to choose. Consequently, the fate of JCPOA is not exclusively and solely in the hands of the U.S. Finally, the grounds also provided for the formation of a new arrangement for regional cooperation such as a "Regional Dialogue Forum," which would be the final blow to the U.S.' unilateral policies in the region.